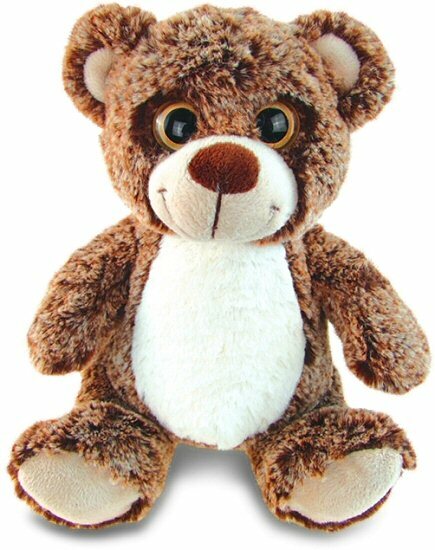 This adorable Sitting Brown Bear Super Soft Plush animal cannot wait to join you for hours of imaginative adventure. Just like it's name implies, the fur on this brown bear stuffed animal is super soft and the special white-tipped brown coloring adds a fun extra dimension to its personality. With a cuddly body, cream tummy, and beige inner ears, muzzle, and feet, this plush brown bear has large metallic yellow eyes that seem to follow you around the room. Fun Facts about Brown Bears: Did you know that in the Fall, as it gets ready for its Winter hibernation, a brown bear may eat up to 90 pounds of food a day? Come Spring, a brown bear may weigh only half of what it did when it began its hibernation.